This was outside of NHL’s classroom on Open House night. We had to figure out which was NHL and we were right. Good job to you all! I still can’t believe he’s in first grade!! Save those self portraits – they might be worth money some day! .-= Harriet´s last blog ..I Challenge You to Leave 1000 Comments!!!!!!! =-. First grade? Oh wow! Such a cute idea!! .-= blueviolet´s last blog ..Mabel’s Labels Review and Giveaway =-. .-= killlashandra´s last blog ..Peeking In =-. 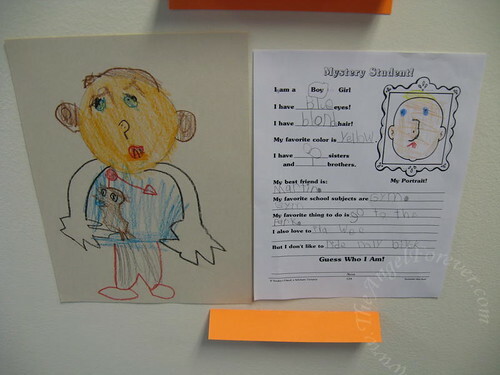 That is a nice drawing for a first grader. I bet you enjoyed the open house. .-= Cascia @ Healthy Moms´s last blog ..Wordless Wednesday | Big Sister =-. That is a great idea. Don’t just love that 1st grade creative spelling? “pla wee” – awesome. Alex made a sign for a lemonade stand and he spelled popcorn as “pokon.” Makes total sense to me! .-= Nancy´s last blog ..WW: 1st grade =-. You have a talented little one for sure! .-= Kari @ A Giveaway Addicted Mommy´s last blog ..Happy Birthday Hubby! =-.